Perhaps you are sick of the standard Adobe Reader and looking for something more. Well this is where NitroPDF comes in. As can be seen from the above image it mimics the appearance of Office 2007, but it also mimics common shortcuts. Tabs are also present in NitroPDF which allow you to quickly see what documents you have open and access them. The benefits from my perspective as a student is that most of our lecture notes are provided as PDFs. I have a number of options for taking notes; hand written and the use of other software (e.g. OneNote). The use of this other software however, generally costs money. So if you're looking for a free computer based alternative for note-taking, you might want to give NitroPDF a try. It is only available for windows at the moment (32bit & 64bit versions). The video below briefly describes some of the features of NitroPDF. For the techies, or people who are just interested in how a piece of software runs on their computer. Basically NitroPDF quite clearly trumps Adobe in File Size. This has been a minor compliant by some users that NitroPDF 1.1 soaks up too much memory. So I did a comparison against Adobe Reader 9.3. In general NitroPDF had a higher memory usage on the test machine. The first three tests involved running the programs simultaneously whilst opening copies of a set PDF document. The final test (i.e. 3 PDFs separately), involved running each program by itself with 3 PDFS of increasing size (1MB, 3MB, 7MB). From my perspective I don't believe it is unreasonable to have a higher memory usage if more advanced tools are provided. Memory Usage was perhaps not critical on this machine, but I can understand that if running NitroPDF on older technology, computer performance may be comprised. 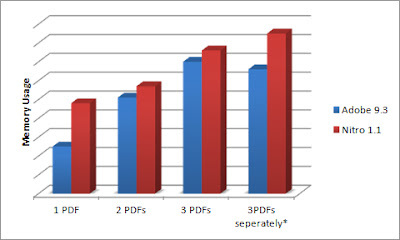 So why not give NitroPDF Reader a try, and see if it boosts your PDFs. NitroPDF also offer a whole range of other free utilities (e.g. PDF to Word/Excel online, PrimoPDF - converts printable documents to PDF files and much more) available from www.nitropdf.com.